Happy Half Birthday to me! Woo hoo! I am awesome! My house is full of Projects I haven’t finished. I’m pretty good when it comes to longer-term projects: I can get them up and functional. But for some reason, the last step or so just doesn’t quite get done. Off the top of my head: my kitchen is just shy of finished because of some cabinet last-touches; the floor of my downstairs bathroom works, but the tiles aren’t reset; my skylights are open, but not trimmed or painted; my murphy bed is constructed, but not decorated. I hope to get some all of these things done in the next week or so. I’ve had enough sit-around time. I think. Yesterday I put the first coat of paint on my murphy bed. I think I’ll do another coat before I pronounce it painted. And it still needs pull-handles. But then it will be done. Hooray! 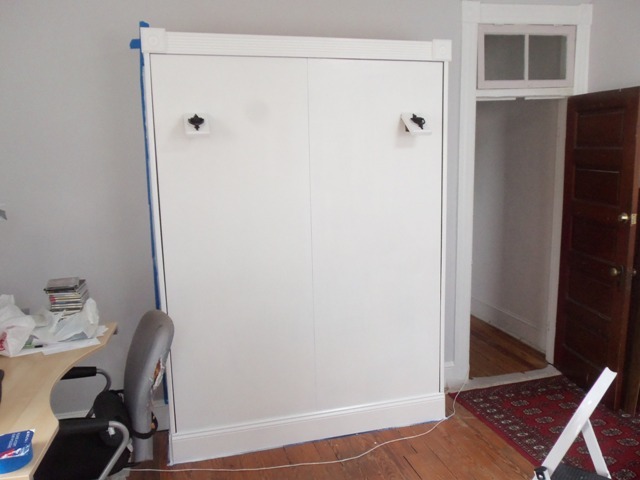 This entry was posted in Murphy Bed, Projects. Bookmark the permalink. One of my favorite tasks is to walk into a room in the house and say, “what needs to be done that I’ve been putting off?” And then do it until that room is finished. While I wish I had OCD for household reasons, I confess that one of my favorite things to do when I get home is develop tunnel vision and make a beeline for the computer, ignoring all else around me. But the consequence is I’m living in a pit. We cross-stitchers are not all that different (in the “almost done but not quite” area, that is). While it is great exhileration to begin a new stitchery project, when one is nearly done there is often still the dreaded back-stitching yet to finalize the piece and…into a bag or drawer it may go. This has been the summer of my piece-finishing as well; much to show for it; feels good. That looks really nice Brad! Well done! And there are alot of nice looking wrought iron door pulls out there. There’s dragons, and gargoyles, and snakes….oh my! Have fun shopping for them!